I would like to thank Graham Ramsey, Brett Hopkins, Bob Hydzig, Peter Lin, Ben Belton, Scott Ware and countless other dear friends of mine here on the forum whom attended our huge show this year. The 2016 Asheville Orchid Festival was a smashing success, and it seemed like everyone in attendance had a great time. It took one full year to piggy back off of our annual show planning to do this event right, and I think we did it. I have made so many new orchid friends, and spent a lot of wonderful time with many of you. I really want to extend a huge thank you to Frank Smith, past president of the American Orchid Society and one of my best friends for providing us with the opportunity to host the American Orchid Society in conjunction with our show. I'd like to also thank our new AOS President, George Hatfield who I believe will be an outstanding president. I also wish to extend a huge thank you publicly to our friend Peter Lin, Peter agreed to come up to see the show to assist Mr. Chen of Mainshow Orchids and serve as a translator as Chen did a program on slipper orchids from Taiwan. Thank you Peter, and thank you Mr. Chen. Overall, we broke records and I am pleased to announce that a total of 29 AOS awards were given out in the show. We must have had over 100 AOS judges attend the event, and I was most fortunate to earn my very first FCC in the show to my hybrid, Blue Ridge Dragon. My plants earned 4 AOS awards, and I even exhibited a first bloom seedling of Paph Julius which won the show trophy for best first bloom seedling. My take home prize for this paph was a glorious custom piece of art glass from Larry Mayse of Nature Glassworks in Atlanta. These folks completed a new series of art glass trophies for our show this year and they were the finest things I have ever seen. I am very excited to have such a work of art. My awarded phals are listed below, and eventually when I have time I will post photos of them. I'm still in shock that all the judges went crazy for my best selection of BRD, cannot believe they scored it at 91 points. Also noteworthy is that Ben Belton showed off some incredible first bloom seedlings of Mituo King Bellina, these were select red flowers and were incredible. One of these plants was nearly awarded and I observed an interesting process. It ended up moving to a different judging team because the judges were too far off and could not align together, scores ranged from 72-85. I then watched this plant achieve the same issues at another team, and ultimately it was not awarded. I am confidant it will get awarded if he shows it off at another time, possibly on a larger plant. Ben was able to get a huge plant of Joy Spring Canary awarded an HCC/AOS. I forget the clonal name and will let Ben respond. But, the plant was beautifully grown in a large container of semi-hydro. Thank you to all of our sponsors, partners, vendors, speakers, friends, growers and enthusiasts who came from all around the world to be here to help make this an event we will never forget. I am feeling very proud! All my best to everyone, and happy growing! Thank you for your show update. I had a great time, and so did Mainshow Chen, Wilson, and Dennis. Show was a great success. Thank you very much for all of your hard work and hospitality. Weather was perfect - and the botanical garden was beautiful as well as the comfort of Hilton where the presentation took place. Ben got his Phal Joy Spring Canary 'Glenda' HCC/AOS awarded. It's a large plant grown in semi-hydro. 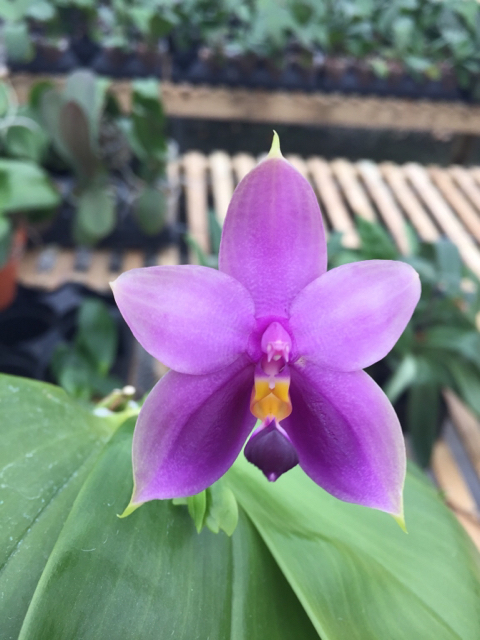 Color of his Phal Mituo King Bellina are awesome - surely be awarded when plants are grown larger. Sounds like an awesome show for phals! Thanks for the report, and I think everyone here (myself included) will want to be able to attend this one day. It really was a great show. Mike and the rest of the Western NC OS did a fantastic job. It was truly a pleasure to attend. Glenn, Brandon Tam is really trying to improve the show at the Huntington. Brandon was at the Asheville Orchid Festival, so he has a high bar for reference now. You know we talk a lot about what can we do really re-invigorate the orchid hobby and industry and then more I think about it, I believe having strong shows like this could really make a big difference.